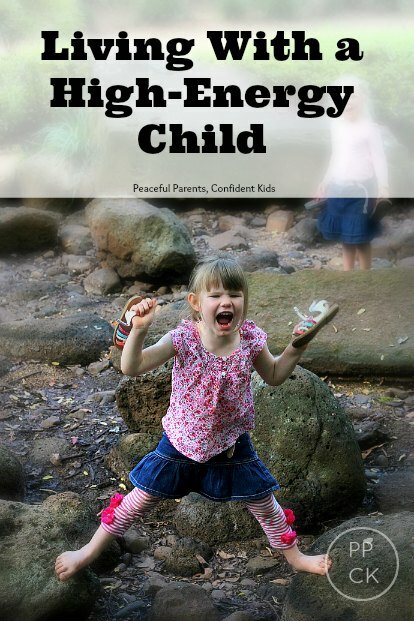 Are you the parent of a high-energy child? It could be argued that all children have high energy levels. Whilst we, the parents, would give anything to curl up in our favourite chair with a good book or even for a doze, our children fight sleep (energetically), and go and go and go as if they are endlessly plugged into the recharge dock. But not all children are the same when it comes to energy. I know because I have one child who is most definitely high-energy and one who does not seem to possess the same incessant need to be on the go and active from dawn to dusk. My four year old, Lucy, has always had an infinite amount of energy. Even in her early toddler-hood, she was always busy. She would barely engage with one thing for more than a couple of moments before something else would catch her eye and she would be off to investigate that. Just a few moments later she would be on the opposite side of the room trying to climb the screen door or scale the kitchen table. As she has grown, she has become somewhat more attentive to activities and slightly more restrained in her choice of activity but even still she rarely sits still for more than a few seconds. In her role playing games she will put everyone to bed for their rest and then less than five seconds later I hear, “It’s morning time!” bellow out from under the makeshift blankets and she would be up and on her way to ‘Playschool’ on the other side of her house. Before long, she would come screeching back into the room ready to put everyone back into bed once more. This repeats for upwards of ten times over. Sitting still is most definitely not her forte. She is constantly seeking new and innovative ways to create excitement in her day. When she is not running around outside, jumping on the trampoline or role playing with fervour, she can be found flooding the bathroom whilst washing her hands in the sink or filling the toilet bowl with the entire roll of paper (including the cardboard tube) or emptying clothes out of her bedroom drawers or climbing onto her high bed head and belly flopping onto her bed below. 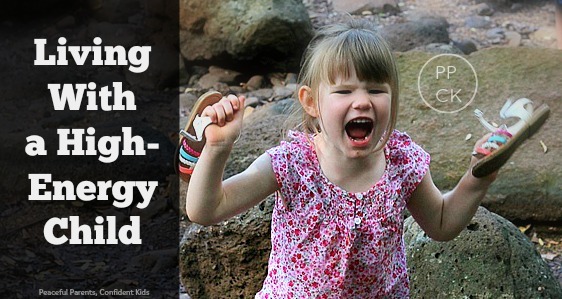 Living with a high-energy child has many obvious challenges. How to keep them safe, how to give them opportunities to burn the energy and how to keep up with them (or slightly ahead) for the entire day. But what I have found the biggest challenge is how to support and even encourage this temperament in my daughter. I hear you crying out at me – WHAT??? Why would you want to encourage such tiresome behaviour? But hear me out. I love this energetic temperament in my daughter and I want to do all I can to support her by channelling her abundant energy supplies in ways that suit the whole family. Imagine you had the energy of your children. Think about what it would be like to bound out of bed in the morning, embracing the day full of gusto and enthusiasm. Imagine being able to complete your housework with an extra skip in your step and still have some juice left over to go for a run or dig out a garden bed or sort out your kitchen pantry. If you are like me, this seems like nothing short of a fairytale. As my children leap on me in the morning, gleefully informing me that it is a ‘SUNNY DAY!’ I drag myself out of bed and then, although my energy and my mood definitely lifts throughout the day, I experience an afternoon energy slump just in time for my children to inform me they will not be needing a sleep that day. The thing is, whilst some of this lack of energy is due to increased maturity and the ageing process (I’m really not that old, am I? ), I can’t help but think that maybe, if high-energy children were celebrated rather than always being told to ease up, sit still or slow down then maybe they might continue to apply the same energy in productive ways as they grow. I certainly understand the need for children to be able to get to a point where they can stop their body and focus on a task. There will inevitably be times in their life where the occasion calls for them to control their abundance of energy and sit still for a period of time such as school lessons, church visits or other formal settings. The thing is though, this will come naturally if we can just trust our children to get there when they are ready. Until that point, it is important that we don’t make high-energy children feel there is something wrong with them. We have to find creative ways to help them channel their energy and satisfy that burning NEED they have to move. In the fantastic book, Raising Your Spirited Child (affiliate link) the author, Mary Sheedy provides an example of supporting a high-energy child at the dinner table. We have applied this to our energetic four year old recently and have been astounded at how much it has helped her and us get through dinner peacefully and civilly. Lucy, like many high-energy children, finds keeping her body still for ANY length of time like a slow form of torture. I see her try with every ounce of her being but it is as though she has an itch that simply has to be scratched. She resists and resists and then a momentary lapse in concentration sees her off her chair and underneath the table or stretching her body across the table to pass her sister a pea or running across the room to grab a little toy she has spotted. Now please don’t be confused, for her this is not testing behaviour. A simple reminder of the table expectations and she straight away jumps back in her seat and resumes eating. She does not continue to push or show reluctance to comply when reminded. In her seat, she shuffles herself from her bottom to her knees and back to her bottom. all whilst spooning mouthfuls of food into her mouth. She turns around to face behind her and then reaches across the table to touch the pattern in the middle of the table cloth before shovelling another mouthful in. Sometimes it can feel like having dinner with the Looney Tunes Tasmanian Devil (Taz). Mary Sheedy suggested in her book that we should recognise our daughter’s need to move and invite her to do so in ways that are still a part of the dinner time process. So now when we see that she is at the point of bursting such that she is distracted from her dinner, we invite her to get something for us. “Lucy, could you please go to the fridge and bring the milk to the table?” She happily does this, her movement itch is scratched and she continues to eat her dinner without fidgeting for a short while. We can then send her to fetch the cups for the family or bring out the spoons for the next course or the drink coasters from the drawers. This way, she feels like she is being helpful and at the same time she satisfies that intense need to move. Recognising that this trait in our daughter is not one to be quashed or stifled has helped us help her in many ways. We try to avoid putting her in situations where she is required to keep her body still for long periods of time such as long church services or waits in queues etc. We pre-warn of any such expectations several times prior to an event so she can mentally prepare herself for the challenge. We recognise her limits and although we do try to extend her beyond them ever so slightly, we are careful in how we do this. Seeing our high-energy children as a gift is so affirming for them. These children are wonderful. They are spirited, fun-loving and adventurous and deserve to feel that way about themselves. They need to hear us describe them in these positive ways rather than make them feel there is something wrong with them. Making statements like “Can’t you ever just sit still?” or “You are so fidgety, what’s wrong with you?” can be damaging to our high-energy child’s self-esteem and confidence. By making small changes in the way we perceive, describe and help our high-energy children, we can set them up to be a bright, fun-loving and energetic adult who is highly productive and healthily active. This entry was posted in Building Confidence and tagged allowing play at age and stage, High Energy Child, Respectful Parenting on April 6, 2015 by peacefulparentsconfidentkids. Your daughter sounds exactly like mine lol! We stopped going to ‘library rhyme time’ as it was too hard to ‘make’ her sit still. We’ve since discovered Miss (now) 6 has low muscle tone – even though she is a VERY active and FIT child it makes it nearly impossible for her body to hold still for an extended period. We’ve been working with an OT and seeing some great improvements! I’m not trying to discourage her need to move because it is actually a NEED for her body but we are working with the OT so she can enjoy activities that require some ‘stability’. I frequently see these children in schools too and then we just adapt our classroom practices to help accommodate their need to move. It might mean adding an elastic to their chair legs, providing them with something to fiddle with or incorporating more movement breaks during the day and during learning activities. I don’t have any specific advice around diet but does she seem to be ‘suffering’ from hunger? Is she getting lethargic or fatigued or is her immunity compromised? Does she eat regularly and seek food when she’s hungry? I would say that if she is ticking all these boxes and seems happy and healthy within herself, you can trust her to regulate her intake but if you are concerned at all, I would suggest seeking some professional advice. Also, ensure she has access to a wide variety of nutritious food throughout the day so she can top up as needed outside of meal times. Sorry, I can’t be more help. All the best.